It's no secret how much I love Mexican food. I love nachos and I will forever be a huge taco and burrito fan. Of course, there's nothing like having a Margarita party that my friends and I would normally have after a hectic work week. I'm pretty lucky that there is one good Mexican food stop available within the neighborhood and another one that's located in Paul's hometown in Pampanga. Well, three is definitely not a crowd and I'm adding one more to my list of favorite mexican cantinas. This one is strategically located near my workplace making it highly accessible at any time. I received an invite to try Agave Cantina at the Shangri-la Mall. While I'm not new to Agave as I have dine at their Eastwood branch a couple of years ago, I still said yes as I am curious if their menu has changed from my last visit. Agave's Chris Maier and Mat Tee took care of ordering for us making sure that we try out their best-sellers. Here are some of the dishes that made me say, "Muy Delicioso!" First on the table was the Nachos Grande (Php. 350). Definitely a party must-have! We all enjoyed digging into the tower of corn chips topped with cheese, sour cream, pico de gallo, guacamole, jalapeño, refried beans and ground beef! *phew* This is a perfect appetizer to get the conversation started. After enjoying the nachos, next came the Chicken Quesadillas (Php. 190 solo/ Php. 325 to share). I love the generous serving of guacamole, sour cream and pico de galle at the side and how huge each slice was. It's always fun to eat quesadilla because it is not messy and you can savor the melted cheese in every bite. 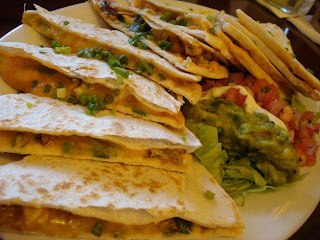 Agave's quesadillas are toasted on the outside and served with lettuce and ranch sauce. Yummy!! Chris asked us if there's anything on the menu that interests us and I didn't hold back. I've been wanting to try their Steak Chimichangas (Php. 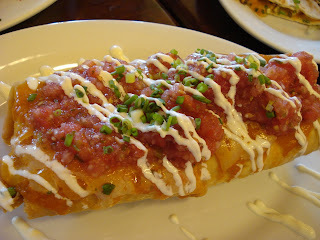 295) which according to the menu is a crispy deep fried burrito stuffed with refried beans, Mexican rice, lettuce, pico de gallo, cheese and since we got the Ultimo, Agave added in Ranchero sauce, Mexican cheese, sour cream and salsa! We sliced it equally so that everyone in the group can have a bite and we all loved it! 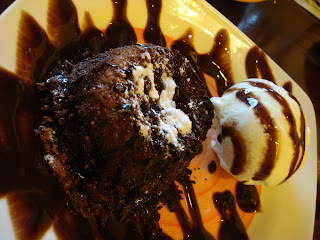 The second dessert was Agave's specialty -- the Fried Ice Cream (Php. 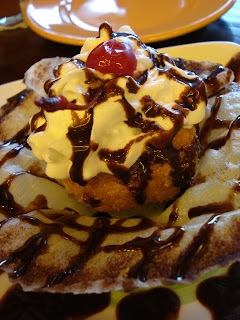 175) which is fried vanilla ice cream on top of a crunchy cinnamon bowl and made more mouthwatering with drizzles of chocolate syrup and whipped cream. This is a very interesting way of enjoying ice cream but the only challenge here is that you have to eat it quickly at the ice cream melts right away. It was an enjoyable afternoon chatting with Chris, Mat and my fellow bloggers. Chris also shared with us that Agave Eastwood is turning TWO this August 22 and to celebrate this, they are offering 2 Peso Margaritas for every Php. 150 on the total bill. What a great way to party! Agave Cantina has three branches located at Eastwood City, Shangri-la Plaza Mall and the new SM City North EDSA Sky Garden. great timing, was just thinking about a resto in Shang that i haven't tried yet...thanks for sharing, can't wait to try the chimichangas and desserts! 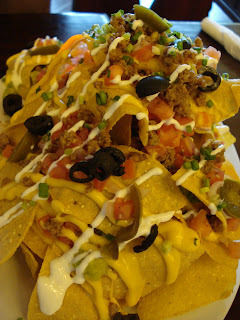 We've already tried Agave and it's good:) we were amazed with their nachos grande!